George Washington Knight was born September 8, 1845 in Lowndes County, GA. His parents were Ann Sloan and Aaron Knight (1813-1887), brother of Levi J. Knight. At age 16, on July 3, 1862, George W. Knight enlisted as a Private in Company E, 54th Regiment, Georgia Volunteer Infantry. His unit fought all over Georgia; at Dug Gap, Kennesaw Mountain, and Atlanta, and other battle locales. Matthew Hodge Albritton, James Baskin, William Gaskins, Samuel Guthrie, William J. Lamb, Jeremiah May, Rufus Ray, and Samuel Sanders, among other Berrien countians, also served in this Company. 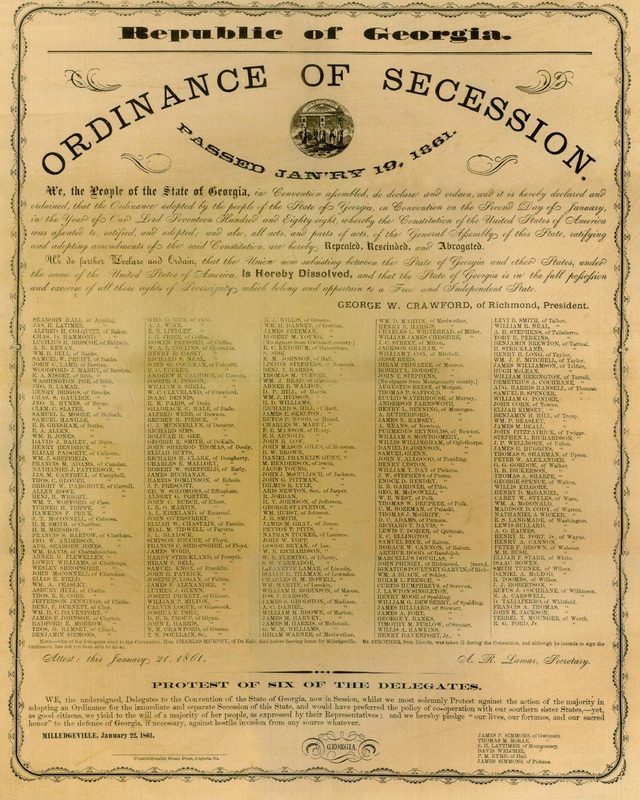 On April 20-21, 1865, two weeks after Lee’s surrender at Appomattox, the 54th Georgia Volunteers, under the command of General Howell Cobb, joined in the last defense of Macon. 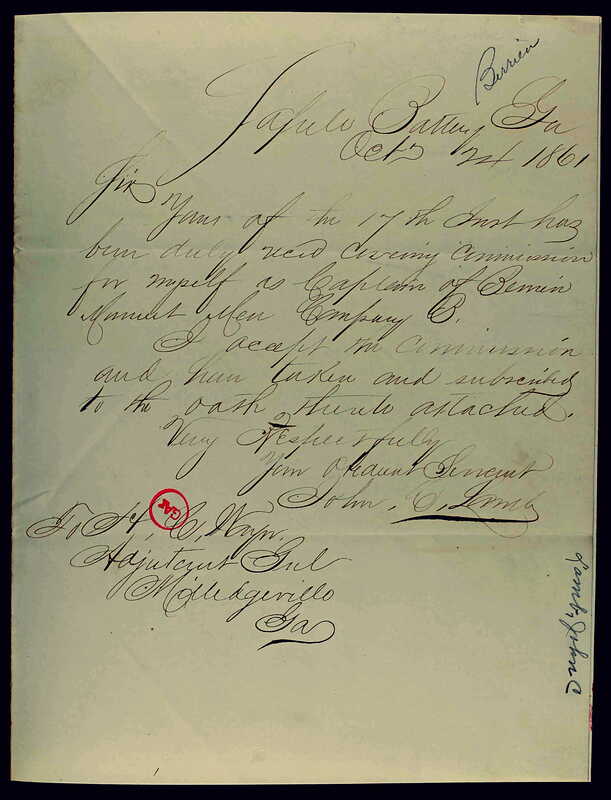 George Washington Knight surrendered as a corporal with Company E, 54th Infantry Regiment Georgia on May 10, 1865 at Tallahassee, FL. On Sept 20, 1865 George W. Knight married Rhoda Futch, a daughter of John M. Futch. She was born October 31, 1846; died January 4, 1909. At first, the newlyweds made their home on a farm owned by George’s father. But within a few months George bought a farm on Ten Mile Bay near Empire Church, about five miles northeast of the site of Ray’s Mill. 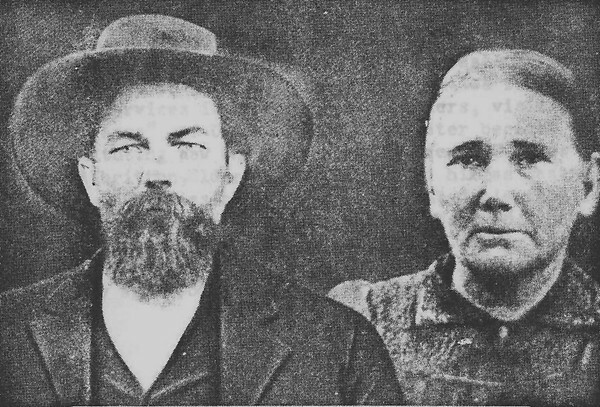 George and Rhoda resided on this farm the rest of their lives. “In 1892 Georgia politics was shaken by the arrival of the Populist Party. Led by the brilliant orator Thomas E. Watson this new party mainly appealed to white farmers, many of whom had been impoverished by debt and low cotton prices in the 1880s and 1890s.” Georgia farmers were being driven into ruin by the combination of falling cotton prices and rising railroad freight taxes . Populism attracted followers in all of the southern states, but it was especially strong in Georgia. Populist Party 1892 Campaign Buttons. Campaign buttons for the Populist Party candidate, James B.Weaver, in the presidential election of 1892. The Populist Party ran a candidate for president, as well as candidates for Congress, Governor of Georgia, and the Georgia Assembly. George Washington Knight was the Populist party’s candidate for Georgia state senator of the Sixth District in 1894, but was defeated. The platform of the Populist movement called for financial policies to drive up the price of cotton, banking reform, government ownership of the railroads, direct election of senators, and an agricultural loan program, known as the Sub-Treasury Plan, which would help farmers get the best prices for their crops. On election day, the Democratic party triumphed over the Populists in the races for the top offices. But the Georgia elections of 1892 and 1894 that kept the Populists out of state offices were marked by blatant corruption. In 1894 ballot boxes in many Georgia counties were stuffed with more votes than there were voters. In later years, George Washington Knight returned to the Democratic party. 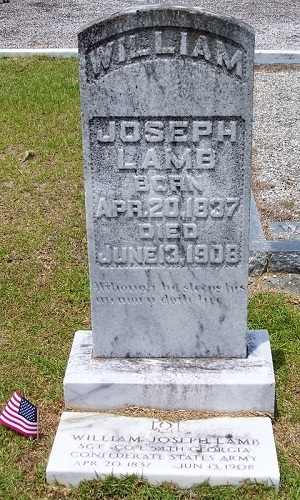 He died 8 Feb 1913 in Lakeland, Berrien, Georgia. 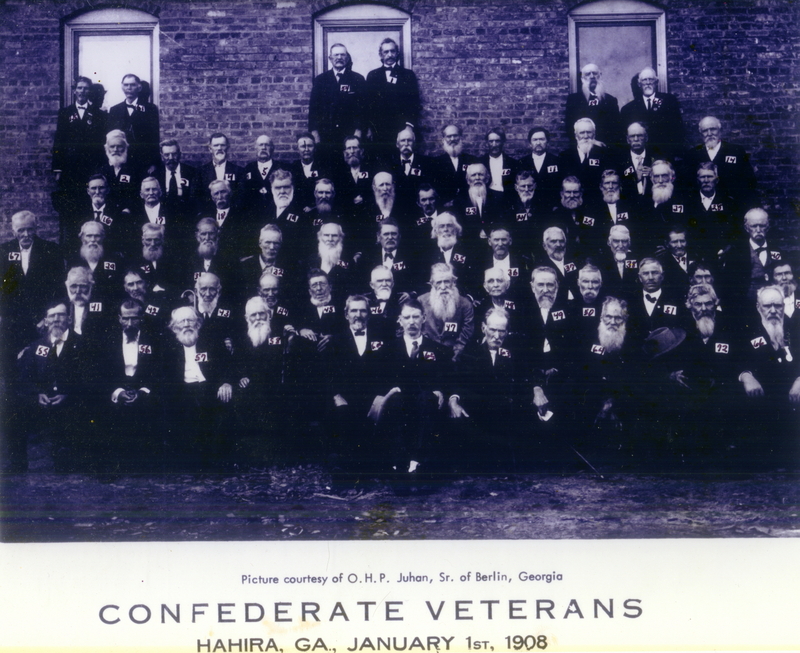 Rhoda Futch and George Washington Knight are buried at Empire Church, Lanier county, GA.
A recently encountered photograph, taken January 1, 1908, depicts a gathering of Confederate veterans at Hahira, GA. Among them was William Joseph Lamb, who long resided in Georgia Militia District 1144, the Ray’s Mill (nka Ray City) District, Berrien County, GA.
William J Lamb joined General Levi J. Knight’s “Berrien County Minutemen,” Company C , Georgia 29th Infantry Regiment in Nashville, GA on August 1, 1861. On the 16th of May, 1862 he was appointed 3rd Sergeant of Company E, Georgia 54th Infantry Regiment. In September 1864 he was shot in the leg. He was sent to a hospital, then furloughed home. Later, Dr. H. M. Talley and Dr. M.Y. Allen, who examined William for his confederate veterans pension application, described the injury, “a gunshot wound just below the right knee, the leg was fractured and gangrene set in.” While William was recuperating at home the war ended. 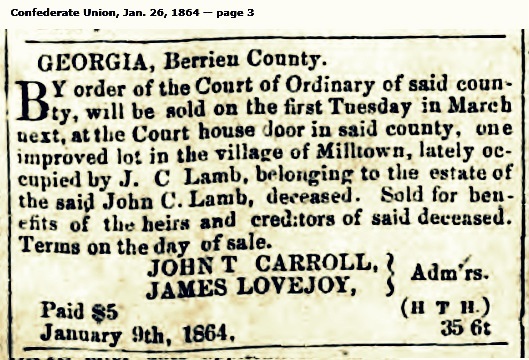 Before the Civil War, William J. Lamb was one of the wealthiest men in Berrien County, with a total estate of $17,880 in the Census of 1860. In 2009 dollars that would have been about $58 million. But by 1870, the relative worth of his estate had declined by 97 percent. 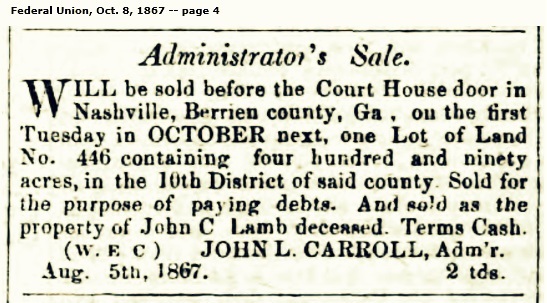 By 1872, the Berrien County tax digest shows that William J. Lamb owned no land. He had $20 cash on hand and other personal property valued at $304 dollars. He employed one hand, a freedman named Morris Wilkins. 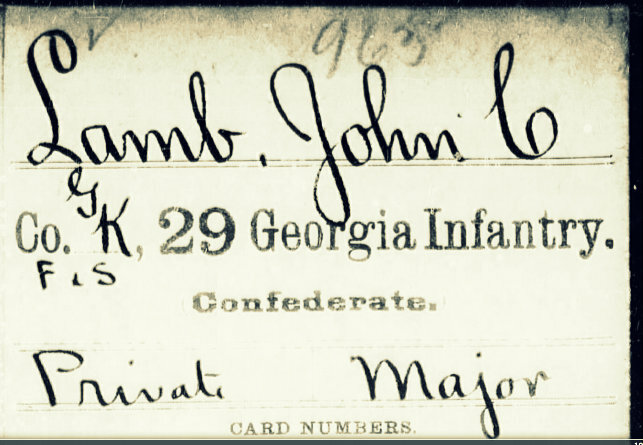 By 1900, completely penniless and unable to support himself, William J. Lamb applied for and eventually received an Indigent Confederate Veteran’s Pension from the State of Georgia. William Joseph Lamb (1837 – 1908). 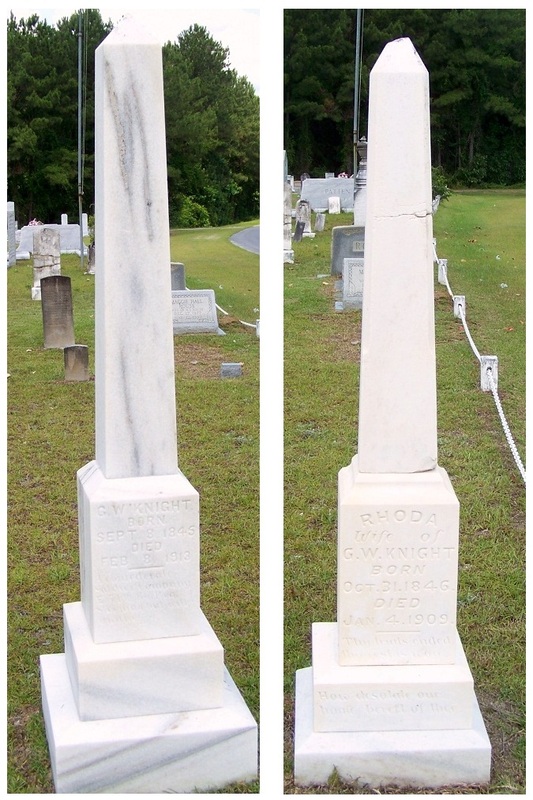 Beaver Dam Cemetery, Ray City, GA.
Samuel Guthrie, whose Ray City, GA family connections have been the discussion of earlier posts, was a Confederate veteran. 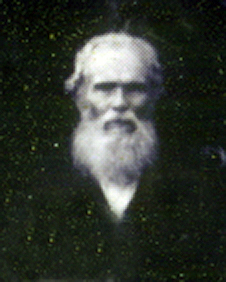 His unit, Company E, 54th Georgia Volunteers, fought all over Georgia; at Dug Gap, Kennesaw Mountain, and Atlanta, and other battle locales. Matthew Hodge Albritton, James Baskin, William Gaskins, George W. Knight, William Lamb, Jeremiah May, Rufus Ray, and Samuel Sanders among other Berrien countians also served in this Company. On April 20-21, 1865, two weeks after Lee’s surrender at Appomattox the 54th Georgia Volunteers, under the command of General Howell Cobb, joined in the last, futile defense of Macon. 2nd Cavalry Division, Military Division of Mississippi. 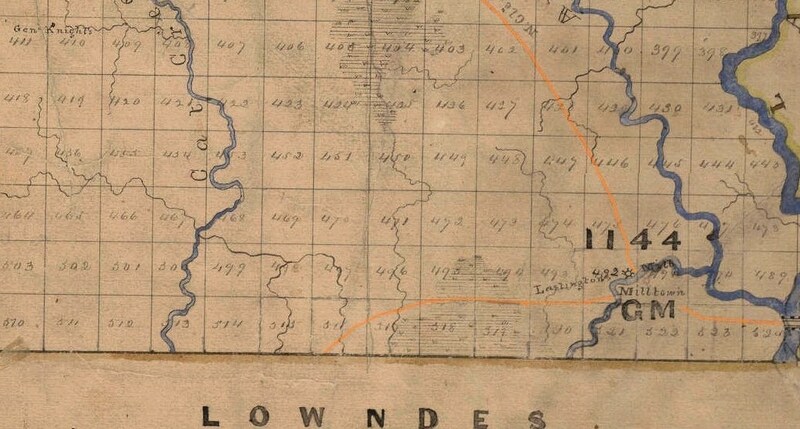 This affair was the last engagement of Wilson’s raid through Alabama and Georgia. When within 20 miles of Macon the advance division encountered a Confederate cavalry command of 400 men. By a series of brilliant charges by the 17th Ind. the enemy was driven from behind every barricade where he took refuge and was completely routed, throwing away arms and ammunition in the haste of his flight. When nine miles out of the city a Confederate flag of truce was met announcing an armistice between Sherman and Johnston, but Col. Robt. H. G. Minty, commanding the advance, refused to honor it and gave it five minutes to get out of the way. The Federals then continued the charge and dashed over the works into the city, which was surrendered by Gen. Howell Cobb. The results of the capture were 350 commissioned officers, 1,995 enlisted men, 60 pieces of artillery, a large amount of small arms, and all public works. The casualties were not reported. Samuel Guthrie lived through the War and mustered out on 10 May 1865 at Tallahassee, FL. He returned to his home in Berrien County where he lived out the rest of his days.